I am working on Backpacks here in Panajachel, Guatemala. What does that mean; I have been surfing around Wikipedia.org for the last hour trying to learn the correct terms that describes what I am doing. I am inserting 12 years of world travel experience put into making backpacks. This means I must find best solutions to backpack problems. Then I am using my skills with computers, internet pages and marketing to vertical integrate the process whereby the design and quality represents my 12 years of experience. I am not going to stop traveling to manufacture, market and sell backpacks. Then I need to map out the steps, from 1 to 10, from A to Z. There is a need for marketing automation, what does this mean, truly confusing, but I think this is the business term that applies to what I am doing. I am listing out problems, and then incorporating solutions into the design and marketing. The backpack pocket is not closed, it is open, and he did not zip it shut. What is the solution? This is a daypack, not a backpack, more like a mans purse than a backpack, the goal is more towards fashion and less functional. Maybe this the correct design, if all this man has in the pocket is cigarettes maybe he needs quick access, and theft is not a problem. If for some reason he stores his Smartphone in the same pocket, then we have a problem. We are automating the collection of backpack information, we will allow readers to give feedback or contribute ideas. Marketing is an educational process, as we explain the pros and cons of backpacks; maybe I can assist backpackers to understand what they are doing? 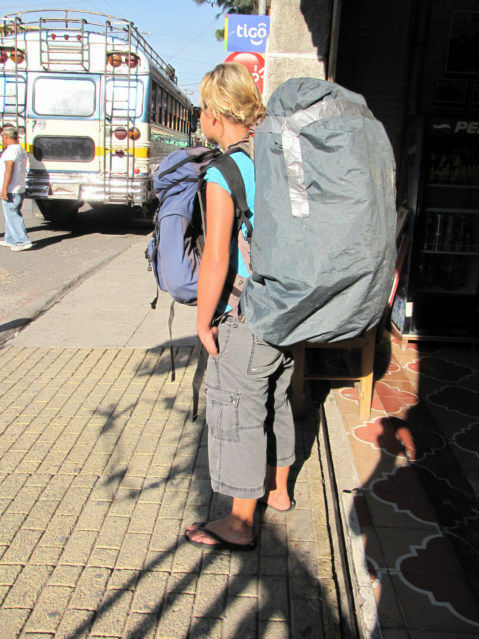 Example: The girl above has on sandals; her backpack is prepared to go hiking in the mountains. She does not know the difference between a travel bag and a hiking bag, they all seem the same to her. She will survive, however the school of hard knocks will continuously knock on her door. David, this is a good question and the challenge to selling a great backpack. You need to follow this page for the next three years and your question will be extremely answered. How do we explain the difference between Hiking and Traveling when generally only a traveler of over one years starts to realize the value specific benefits of a bag. This is why I am dwelling on the term Marketing Automation here. Frequently ask questions, pro and cons need presented in a manner that can easily be understood without confusion. I was explaining and asking Boy Genius yesterday about Shopping Carts. "Why do backpack companies only show 2-3 photos and expect a person to buy a backpack?" There should be at least 50-100 and if a reader request a different view, the company should take the photo and add it. If I am showing a buckle, the reasons why this buckle was chosen needs explained. 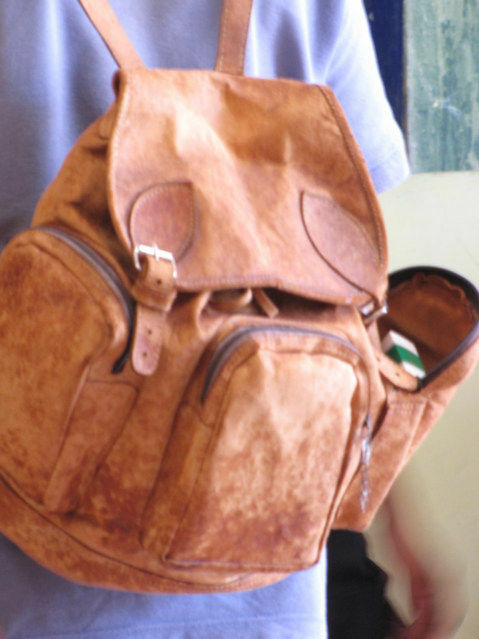 Then if I want to sell the best possible bag, I need to allow readers to suggest better buckles. Did you get an instruction manual with your backpack? If not, maybe the vendor does care how you backpack experience is, they only want the money. Really excellent photo of the careless "daypacker" in Pana, when people come to popular destinations, they often become relaxed and careless. When I lived in Guate, I would always advise visitors going to the crowded Solola Market, worked by professional thieves and pickpockets, to avoid bringing expensive camera, leave passport and other valuables locked up and put cash three of four places on your person, I saved one Spanish friend of mine a bundle, saw him get "hit" for the Q35 (then about = $6 US) he had in his pocket, no more, on my advice, oh some of those pros.. guys (and gals too) can steal your socks without taking your shoes off! 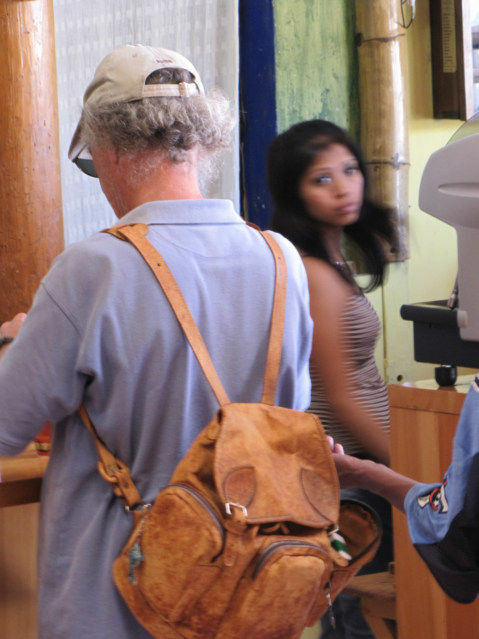 click on and read http://www.goodtimebob.com/safety.htm 'pack security' Bob has been traveling to Latin America since 1970. All the good advice in the world not much good if people get careless and vulnerable, in any croed of 100, 99 are honest hard working persons, it's that ONE thief out of 100 that can ruin a journey! Seen it time and time gain. Good luck marketing. Get a good logo..recognition sells.